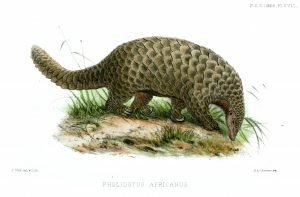 Illustration of the long-tailed pangolin (Manis tetradactyla) by Schuppentier. Outside of Asia and Africa few know of the gentle pangolin. Little waddling hunchbacks that love ants, and look like living artichokes. Pangolins often create more questions than answers, and as the population dwindles, we may never get to know some of their mysteries. For as little as they are known to people, they are equally as endangered due to the pursuit of their scales for herbal remedy. To describe the pangolin as a “scaly anteater” is a close idea to how they look, but they are more related to wolves and bears in the Ferae clade, than to the anteater and sloths of the world. The eight species of pangolin contribute to a wide degree of activity. Some species prefer to be nocturnal, sleeping in a curled ball during the day. Others such as the long-tailed pangolin are more active at day, using their sharpened sense of smell to find insects. Arboreal versions of the species live happily in hollow trees while others will sleep burrowed into the ground. Despite the diversity of all eight species they do share many traits. The female of the species is known to carry babies on their rather prehensile tails; keeping watch over their young for the first two years of their life. Additionally pangolins all walk “hunchbacked,” balanced on their feet with their clawed forearms near the ground. More strangely, all eight species have been observed swimming, and being quite good at it. Of all the similarities and differences the pangolin has, it is the scales that are prized and put them in the eyes of poachers. All pangolin species tend to be relatively calm, submissive insectivores. Their best source of defense, apart from a musky odor, are the hard keratin scales that plate their entire body. Curled into a ball the pangolin is like a little fortress, almost invincible to the world around it. It’s not uncommon to see a tiger or lion batting one around like a ball. Both eventually get bored and go about their way. Sadly the passive defense coupled with the desire for the scales makes them very easy to poach by simply picking them up. Unknown to large portions of the world the species inhabit most of sub-Saharan Africa as well as Southeast Asia. All eight species are classified by the IUCN as threatened with extinction while two of the species closest to the problem are classified as critically endangered. The still strong desire for herbal remedies drives the poaching and trade of pangolins despite the international ban on their trade. One of the biggest seizures took place in 2013 where over 10,000 kilograms of meat was seized from a Chinese vessel. Unfortunately this is only the tip of the iceberg. 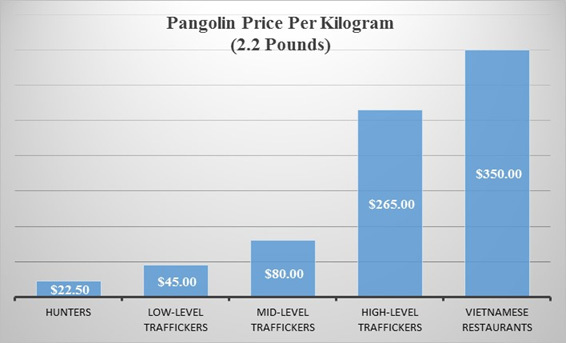 From 2011 through October 2013 Annamiticus put the full number of illegally trafficked pangolins at between 100,000 and 210,000. Scientists and conservationists have no idea how few are left, but at such large reported numbers, the world’s population is shrinking fast. To further the issue pangolins are solitary in nature, and only meet to mate once a year. Most species only produce one young, and while a few are known to have two to three, the species in unable to maintain population at such a slow birth rate. Chart Data Source: CNN.com, TRAFFIC, and IUCN. 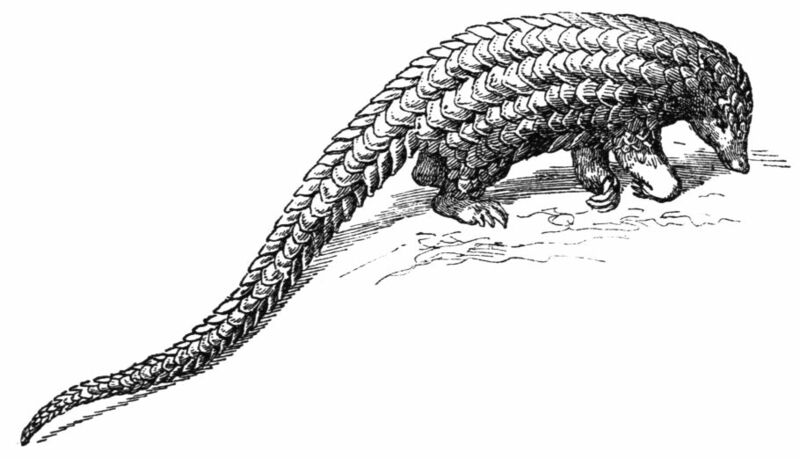 Illustration of a Giant Pangolin (Smutsia gigantea) by Joseph Wolf. Due to large illegal trafficking of pangolins, coupled with the lack of knowledge about the problem, the IUCN SSC Pangolin Specialist Group was founded to create a group whose mission was the preservation of the species before it becomes too late. External from the official efforts there have been several groups formed to get out awareness of information to the public. In 2015 Google included the Pangolin in its Earth Day 2015 doodle quiz. Locally to where they live and are poached many national parks have created conservation areas to protect the pangolins. Underfunded, but with big hearts, volunteers and scientists are working diligently to try and stabilize the population in a captive environment. In that kind of safety, often with armed guards and multiple cameras, the pangolin is safe from poachers. However they aren’t safe from themselves. Due to the lack of research into the species many die from unknown factors. Diet is still being understood, infection is still an issue even with near hospital grade precautions, and stress alone can cause problems. Outside of these local areas the only pangolin in a zoo in the United States for the public to learn about is in San Diego, California.